1825: Jefferson City was incorporated as a city. 1838: Land purchased for $32. 1858: The first (frame) building was built on this corner. 1860: John and Barbara Opel operated a beer saloon in the frame building. 1870s: It was Joe Haas’ Saloon: “Always a cool spot! Always fresh beer!” There were Saturday evening dance parties with live music on a wooden stage in the backyard. 1881: The business was called the Farmer’s Home Hotel, where farmers could stay when they came to town by horse and wagon. The saloon and restaurant were run by Jacob Schmidt. Schmidt was nicknamed the “Moreau Eisbär” (polar bear) because he used to cart ice from the nearby Moreau River to sell in Jefferson City. 1890s: The old frame building was torn down, and today’s three-story brick building was erected. 1897: Nick Kielman and Ben Humbrock took charge of the Farmer’s Home Hotel, pool hall, and beer saloon. They offered a large buffet for travelers and took good care of their horses. The present bar floor was imported from Italy. A “cave” helped with cold storage, and an underground tunnel connected the business with the Capitol Brewery and Ice Company on the opposite side of the intersection. 1906: Kielman purchased the entire building and continued the business. His lunch counter served hot tamales and pretzels. But Prohibition was difficult. Kielman died in 1928. His heirs, and Emma and O. C. Howser, continued the business. 1930s: Traveling circuses and sideshows performed on the land behind the building, where wagon yard and stables used to stand. 1937: Prohibition was difficult, and the bank foreclosed on the property. It was sold on the sheriff’s steps to Cole County Bank for $500. Emma "Big Em" Haulenbeek outside Farmer's Home1938: Leonard Weavers was issued a liquor license and operated the Farmers Café, serving 3.2 beer, sandwiches, and chili. Tragedy struck later that year when a fight broke out with a patron, and Mr. Weaver suffered a fatal skull fracture when he struck the floor. He was only 28. 1941: 703 Jefferson St. became Emma’s Tap Room, owned by Emma (“Big Em”) Haulenbeek. She had two bars, in front and in back, and operated with a 3.2 beer license during World War II. She also loaned money, acting partly as a pawn shop. She died in 1958. 1945: Earl and Kay Childers purchased the business, naming it the ECCO Lounge after “Earl Childers Construction Company,” and using the same ECCO logo. Some items in the bar today date from this era, including Buddha, the Foo Dogs, and the framed print of the Blue Lady. The small kitchen had the first (“huge”) microwave in Jefferson City, plus a pizza oven. The bar had a walk-in cooler, and the ceiling was lowered, covering up the original ornamental ceiling. Kay Childers died in 1965 and Earl in 1971. 1967: Leon Alber and Ray Sandbothe purchased the ECCO from Childers. Later that year, Leon and his wife bought out Sandbothe. 1969: Phil and Barbara Williams became partners with the Alberses. Later that year, Wade and Bernice Hampton purchased the Alberses’ half of the ECCO. They redesigned what had been the “Chinese” dining rooms, lowering the ceilings, and installing red shag carpet and black-and-white plantation-type wallpaper. They removed the old venetian blinds and put drapes in the windows. In October 1970, Phil Williams passed away, and Barbara continued the business with the Hamptons. 1972: Barbara married Joe (“Pickles”) Stegeman and bought out the Hamptons. Pickles had been helping in the bar for some time. 1973: Building owners Don and Judy Connor did extensive renovating. 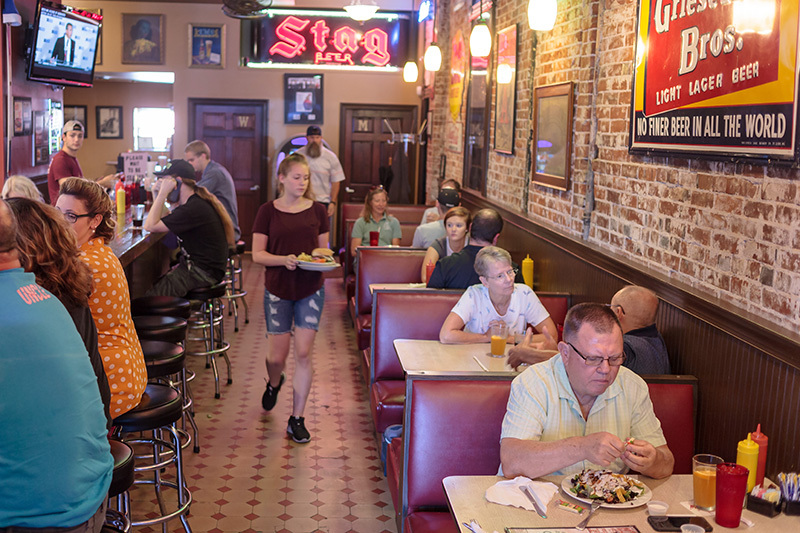 The bar and dining room were paneled, the booths reupholstered in red, the old kitchen torn out, and a new, enlarged, updated kitchen installed. The old steam radiators were removed. New carpeting went into the dining room, and the present back entrance was built. It wasn’t enclosed, and the steps were covered with Astroturf. 1979: Central air conditioning was installed, the back steps were enclosed, and a new front facade was put on the building. The front windows were changed. New booths were purchased. 1989: Barbara and Pickles parted ways, and she became the sole owner. The tribal masks in the ladies restroom today were brought back from Hawaii by Barb; previously, they hung on the back bar. 1993: Paul and Rayma Chinn purchased the ECCO from Barb. 1994: Rusty Thomas became a partner with the Chinns. 1995: Phil Vanderpol bought out the Chinns and became a partner with Rusty and Chris Thomas. 2009: Don and Sally Powell and partners Mark and Anna Ewers purchased the business, renovating the bar, kitchen, and dining room. Many features, including the tin ceilings and artifacts of the original building, were cleaned and kept intact. Buddha no longer sits atop a cigarette machine but is displayed in his own niche. A collection of historic beer memorabilia decorates the bar area. Today: Still going strong, you can enjoy the heritage and hospitality of Jefferson City’s oldest restaurant and lounge! ECCO’s name and logo originally came from “Earl Childers Construction Company.” Earl and Kay Childers bought the business and gave it its current name in 1945.